How to Create the Perfect e-Newsletter For Your Company’s Email List - iSmallBusiness.com - Small Business Stuff That Matters...Pass It On! So your company has built up a hefty email list – now what? Regardless of how many email subscribers you’ve got, each and every one of them is now going to be expecting some sort of communication from you to enter their inbox, and soon. You can’t just send your readers random content you deem relevant, however; a newsletter must be concise, engaging, and well thought-out in order for it to avoid the doom of a subscriber’s trash folder. Follow this comprehensive guide to keep your subscribers reading – and coming back for more. Who makes up your company’s target demographic? Like with any other marketing campaign (because an e-newsletter certainly is one), you have to consider your audience before you design and distribute your newsletter. If your business is aimed toward younger people, you can get away with witty humor and references to pop culture in your newsletter; if your business is directed toward middle- or retirement-age people, you may want to stick to a more formal or educational approach. Keeping with common stereotypes, products and services designed primarily for women could benefit from monthly style guides, updates on upcoming women’s business forums, and family- or home-related tips and tricks, while those designed more for men could benefit from sports updates, men’s accessory guides, the latest and greatest on automobile innovation, and other traditionally-male topics. Just make sure the helpful hints, articles, videos, infographics, and other bits of information you include in your newsletter relate back to your company’s core. The length of your e-newsletter should depend on how frequently it’s sent out. If you plan on sending your subscribers emails weekly or several times a week, each one should be short and sweet so your readers don’t get overwhelmed. If your newsletter will only make an appearance biweekly or monthly, you can get away with a longer and more comprehensive email – as long as the content is still engaging and worthwhile. Subject lines should “hook” readers enough not only to make them open your email, but also to make them actually want to read it. Nowadays, tens of thousands of businesses send out e-newsletters for a variety of reasons, and yours will become just another one of hundreds in a subscriber’s inbox unless you make it stand out. Depending on what’s inside your e-newsletter (a topic we’ll get to shortly), the subject line should create a sense of urgency, pique the reader’s curiosity, make the reader laugh, or reach out to the leader personally. Avaaz, a “campaigning community bringing people-powered politics to decision-making worldwide,” is great at nurturing a sense of urgency and responsibility through the subject lines in their emails. JackThreads, an online men’s clothing store, hooks their subscribers with funny and catchy subject lines. In no case should your subject line be entirely plain (“Our March Newsletter”) or use acronyms to shorten up length (unless they’re a part of a pop culture reference). If your business covers more than one major demographic (say, for instance, you offer auto insurance or teach computer skills to both children and the elderly), try offering up the same content to both with a different subject line for each. Certain email distribution software, like Campaigner and MailChimp, allow you to send the same email with different subject lines to pre-designated audiences. This is also a great feature for new e-newsletter writers who want to see which subject lines generate the highest open rates. Perhaps the trickiest but most important part of building the perfect e-newsletter is creating interesting and relevant content. No matter the main focus of your e-newsletter (product marketing, education, building up a cause), your business should maintain its subscribers’ trust by making the main content actually match the subject line. No reader will hit the “unsubscribe” button on your website faster than one who’s been betrayed by the subject line of your email. When writing an e-newsletter, pay close attention to the 90-10 rule: 90% of your newsletter’s content should aim to educate or entertain the reader, while only 10% should exist to advertise. This may seem counter-intuitive – your e-newsletter exists primarily to increase familiarity with your business – but in order to nurture and preserve readers’ interest in your company, you’ll have to ease back on selling. Instead, try covering events that circulate your industry (like the US Open of Surfing if you sell high-end surfboard wax), educating your audience on topics related to your business (how to make delicious chocolate ganache if you sell gourmet chocolates), or embedding relevant photos and videos that aim to entertain (adorable proposal videos if you’re a wedding planner). Not only does this please your subscribers more than straight-up advertising will, but it also provides them with something to talk about, encouraging word-of-mouth marketing for your business. 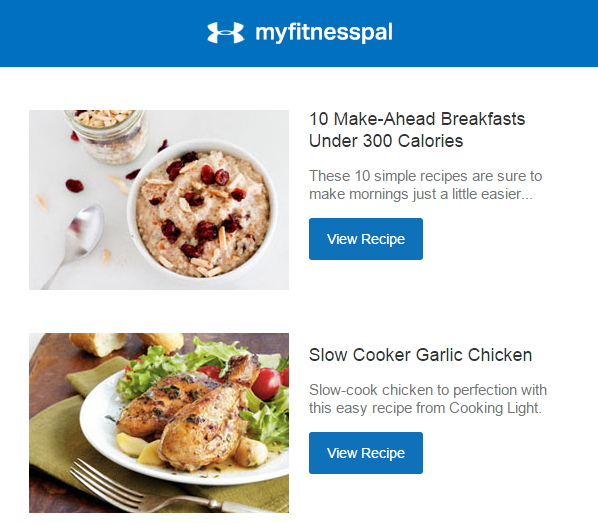 MyFitnessPal, Under Armour’s popular calorie-tracking smartphone application, regularly sends their users healthy recipes via email. Even if your e-newsletter comes with several calls-to-action, place your most vital one at the top. Many e-newsletter subscribers check the very beginning of an email after opening to make sure it’s one they’re interested in, so you’ll want to catch their interest as soon as possible. For instance, if your restaurant is hosting a holiday event (which is obviously very time-sensitive), you’ll want to put the ad for it – and perhaps a link to buy tickets – at the top of your newsletter. 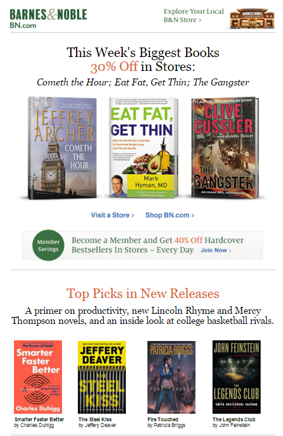 Below, Barnes & Noble’s main call-to-action, a limited-time discount on a small selection of books, is placed at the top of their newsletter. An e-newsletter isn’t just a virtual newsletter, anymore – it’s a medium through which companies can enhance the tones and attitudes that their brands convey. Most businesses use specific colors, fonts, layouts, backgrounds, and foreground images to match their products’ or services’ style. Though this is a fun way to flex your creative mind, don’t go overboard; particularly dark colors, complex patterns, and difficult-to-read fonts could overwhelm your readers and cause them to switch to another brand. Instead, make your e-newsletter easy on the eyes by selecting a few base colors to work with, sticking with a simple, readable font, and organizing separate elements so that they have plenty of white space between them. 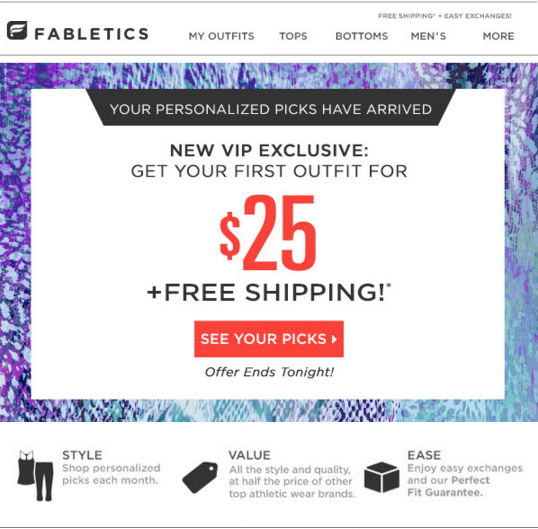 Below, Fabletics places a white box over a colorful background to make the main text (a discount notification) easier on the eyes. Though the background is bright and complex, Fabletics maintains uniformity with their other emails by sticking to text and links that are black, gray, and coral. Let’s be honest – even if your weekly, biweekly, or monthly newsletter is entirely fascinating, your target demographic won’t know it until they sign up. And how can you get them to sign up without giving them an incentive? Though this goes back to building up an email list in the first place, it’s important to know as you write your company’s e-newsletters. If your readers were promised regular coupons for subscribing, they’ll be pretty upset if those coupons never come (or come once, then disappear forever). Once you’ve promised your subscribers incentives for sending in their email address, you’ll have to keep providing those incentives to maintain their trust. Coupons aren’t the only incentives businesses can provide for signing up for their email list. Early access to special deals, industry exclusives, and relevant events can convince readers to subscribe (and stick with) your e-newsletter. So can exclusive access to thinks like e-books, webinars, and audiobooks, as well as entries to a giveaway. Though writing the perfect e-newsletter may be tough at first, soon you’ll be a pro with hundreds (or thousands) of subscribers waiting to read more.